I received a question a couple of days ago and figured it would be easier to reply fully as a blog post rather than give a brief response through the comments reply, as I think this question will resonate in the minds of many who are thinking or planning to start home education. I'm going to respond to this question in 2 parts inshaAllah. Part 1 being my own response and in Part 2, I will gather some of the responses to a questionnaire I sent out a short while ago asking home educators about their thoughts, styles and backgrounds to home ed. This kind of question probably runs through the minds of (almost) every single parent who thinks about embarking upon the home-education path. For the majority of us, we ourselves were educated in the traditional school fashion. We know school. We know the teacher knows best and the student (and their parents!) know nothing. We know this box and until we start to home educate, most of us are still stuck inside it...but once we dare to educate our families ourselves, we will escape and learn to think outside its boundaries inshaAllah! However, as a loving parent you are in the best position to teach your child. You know your child better than anyone else, and no one wants them to succeed more than you ever will - not even the most dedicated teachers in the profession. You are totally your kids number one champion ....even during those times when they (and even you) might not think so after they have been sent to their room or reprimanded for misbehaviour. Because even when you discipline them, you are doing it from a place of love and a strong earnest desire to build them for long term success in both the dunya as well as more importantly, the Akhira. Your question reminds me a lot of myself as a new Mum to home education. I remember when I started, I was completely clueless...I still feel clueless even now 3 years later, but Alhamdulillah, at least now I have a bit of balance with that cluelessness! I was so worried about not meeting the "school standards" I became a militant teacher-Mum (more accurately: psycho-mum!). I'd be in tears as well as my then 4 year old some days. I was trying to replicate school. Alhamdulillah, I finally learnt that home schooling is not the same as school-at-home! The biggest tip I can probably give you, is do not even attempt to replicate the "school" model as a home educator. 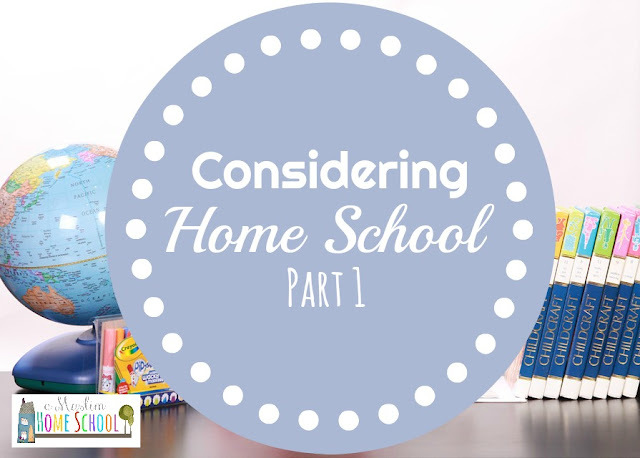 Home schooling really is not the same as School-at-home.They are in fact worlds apart! First off, your home is exactly that - your home. A place of rest, a place of sanctuary, a place to escape the hustle and bustle of the outside world. Keep it that way. Secondly, you don't need to spend 6 hours a day officially "schooling" - depending on where you are in the world your local authority / State may have certain requirements so you will need to find out what those are. But generally speaking, you do not need to spend 6 hours a day working as they do in mainstream school institutions. And certainly not at ages 3 and 4....at this age children need a lot of play and not a lot more. You may only need an hour or 2 to accomplish everything you want to. Let me assure you, there is no right or wrong way to home school....so long as learning takes place! What works for one family may not work for another. As you try things out and figure out what works for you and your child's learning style, your confidence in your ability to teach your children will grow inshaAllah. Allow me to remind you that your son is only 3 years old, so in September I am assuming he will be 4 inshaAllah if you say he is due to start school. Please believe me when I tell you, he is still a baby! He is still tiny mashaAllah, so my advise to you is don't overwhelm both yourself and your son at this young age. Children this young benefit and learn so much just by being with you and having the freedom to play, explore and be just take everything in. Being with you at this young age is the best place for him and far superior than being left with strangers in a school. If you look at the various education systems across the globe, you will see that in the vast majority of counties, formal education does not begin until the age of around 6 or 7, and their Education system out performs the British standards and results (Finland comes to mind). There are some pretty awesome examples online that will be able to give you plenty of ideas of fun learning through play activities you can try out inshaAllah. You want the main objective to be helping your child to develop their natural innate curiosity and desire to learn through play bi'ithnilllah. When it comes to subjects like maths which you mentioned, make it as practical as you can. Get out the building blocks and count them together. See how many blocks there are when you take 4 red and 3 blue together! Find out how many of your son's hands are needed to measure across the length of the table! You may like to read my previous post about keeping maths real. Maths is not as scary as we may have been taught to believe. When your child gets older, if you prefer to follow a curriculum, then there are plenty to choose from. .....but don't rush into buying straight away! That's the 2nd trap many new home schoolers fall into! We will buy every resource and curriculum we see, only to discover they don't work for us or there is something else better, leaving us with ££££££££'s lost! Another option if you really feel unable to teach a particular subject is tuition, co-ops (if you have one nearby) or online learning. Home schooling doesn't mean it has to only be me myself and I. Benefit from the skills other people offer and resources available to you - it doesn't make you any less of a home schooler - in fact it makes you a better one. To help you figure out what you want for your home school, you might want to think about a few things to help you understand why you want to home educate and I'd recommend writing your answers down. What is important to you and your family Islamicaly? What is important to you and your family educationally? What is important to you for your family? Are there any educational philosophies that appeal to you, or you think may suit your family? Ease yourself slowly into home-education, don't put so much pressure on yourself (and son!). Relax, seek support from other home schooling families, have fun, play and allow yourself to think outside the "school box". Jazakillahu Khair dear sister. The post has seriously opened up my mind. I live in an apartment and the outdoor activities of my child is very limited. I don't like to go out alone as well. Will that impact home schooling? I wouldn't worry that you live in an apartment Alhamdulillah. Where you live is not important, it is what you do that is! Are there any other home schoolers in your area? If there is, you may find some activities which have been organised for the home school kids. I am assuming that you are married (forgive me if you are not) - make time when your husband is home to go to the park or to take a walk in the forests or whatever you have nearby. I don't like going out alone unless I really have to, and so aside from local homeschool activities, we tend to go out to the parks and such things at the weekends when my husband is home. - this is also because during the week there is so much to do at home when we are home schooling, we just don't have time to go out. If you have a search on google, you can find bloggers who live in apartments, you may find it helpful to see how they do things when living in a small space.....pinterest is also a great tool to find ideas! let us know how you get on inshaAllah! May Allah give you and your family success! 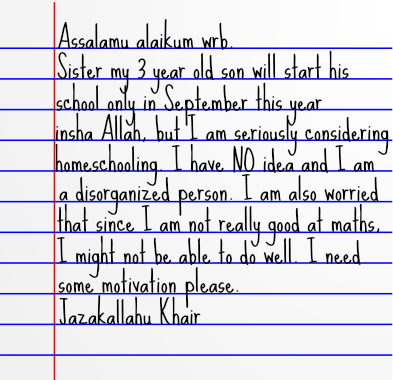 Assalamualaikum sister @ A muslim homeschool. No, I am not affiliated to Salafi Publications personaly. I however do listen to their duroos and read their books, as well as from other known Salafi students of knowledge in the West. Sister that was an uplifting blog. Something I'm going to keep and refer back to when my time comes. I'm more so daughter by what my in-laws will say. They mean well for both myself and my son and thing I should either get back to work or further my studies even more to keep my brain working and not have a typical mothers brain. I feel down want to homeachool. I know it's hard with certain comments. Any advice on how to persevere and to ignore or deal with those comments. It can be difficult with family's attitudes if they are not supportive of home education. Certainly, having them on board would make things easier. For many people, home education is something alien, it is strange or even unheard of. It might just be they need a little time, and information to understand this alternative education method and to see the potential fruits it can deliver inshaAllah. My advice would be to remain patient with them, and if it is only your inlaws who are insisting that you should return to work, then so long as you have the support of your husband, I wouldn't worry. From an Iskamic perspective, you are under no obligation to work and your role is indeed to look after your home and children. Be patient with them, treat them with kindness and respect, and inshaAllah over time they will see the positive impact home education brings to you all.